As some of you may or may not know, I am a small space gardener who’s obsessed with secret gardens and pretty much anything to do with vines, hedges and espalier. That’s why I think everyone should pick up Rebecca Sweet and Susan Morrison’s new book Garden Up! : Smart Vertical Gardening for Small and Large Spaces. This book is right up my alley! It’s full of amazing pictures and how-to’s that’ll inspire (corrupt) anyone into adding more vertical interest to their garden. You think I’m kidding? Since reading Garden Up! I’ve purchased two plum trees to espalier, one espalier 3-way cherry tree AND just yesterday I ordered a hop vine from Peaceful Valley. Since we’re trying to be self sufficient, these new edibles will be a great addition to our potager while adding visual interest to our last few bare walls/fences. I mean, look at the beautiful hops picture I stole from the book! Makes you want one too, doesn’t it? The book also covers vertical gardening like succulent walls and Woolly Pockets. Two things I hope to experiment with some day. Plus, it includes plant recommendations, artwork ideas and creative materials you can use to grow your garden upward. If any of this resonates with you, you will want this book. Plus, if you purchase Garden Up! online, Susan and Rebecca are offering a signed bookplate to the first 100 people (click here to see the hand illustration by Susan). Just send an email with your name and mailing address to: susan@morrison-sweet.com. Because this post is part of a cyber book launch, I have the pleasure of giving away a $25 gift certificate for Peaceful Valley (www.GrowOrganic.com). Peaceful Valley is an online organic nursery and garden store – I especially like their organic fertilizer selection. Just think, if you win, you can get a hop vine too! To enter the contest, all you have to do is leave a comment below – winners will be chosen randomly. The contest runs for a full week, so check back on March 21 to see if you’re the winner! Of course, it wouldn’t be a party with just one prize. That why you have six more chances of winning!! Below is a full list of participating blogs and the prizes they’re giving out. The top link takes you to the blog where you can enter to win – the bottom link takes you to the vendor site where you can purchase the prize if you don’t win! Disclaimers: 1. I did not purchase the book but was given a copy for review. My garden is pictured in the book (pages 10, 33, 74). I feel blessed I was asked to review the book and participate in this cyber book party. I would’ve purchased the book anyway because it’s a subject I love. 2. I’m excited I get to give away the Peaceful Valley gift card. They’ve got a fantastic selection of organic fertilizers and plants, and they have a beautiful catalog. I really did purchase one of their hop vines. I would love to win the gift card from Peaceful Valley. Thanks for the opportunity to win. What a lovely garden you have and what a neat book! Thanks for the chance to win from Peaceful Valley! I’m always looking for more inspiration! This book is a “must have”! Love your blog too! I’m new to your blog, but I can tell I need to read through it for inspiration. Thanks for sponsoring this giveaway! This book looks like something I’d love…definitely going to look for it! This book has me excited and inspired to try some new techniques in my garden this year. It’s on my order list and I can’t wait to get and read it in it’s entirety. I worked with Jim Martin for years and I’m so pleased to see him receive the recognition he deserves! I’m ready for some organics! Love your blog…makes me homesick for the NW. Hope to see you in the new book. What an honor to be featured in the book. Please enter me for the contest. Peaceful Valley is such a great company. I found you by way of Pam and love what I see so far. Can’t wait to go to B and N to see a copy of the book and your pages. Always on the lookout for new vines… will hop vine grow in Austin 8b? I have plenty of space, but vertical gardening is sure convenient and gives me even more space for growing! Giggles I want to order hops this year, but couldn’t decide what type to order…some apparently more bitter than others. You have suggestion and source that would work in Zone 6b? I love the book, and I too love little secret gardens. Mine is at the back corner of the house opposite from the gate and hidden from the patio. I love sitting there, watching the birds in the trees and scratching the cat. It’s my little shangri la! I love that the idea of vertical gardening is getting more attention. As space to garden in gets smaller we all must look to new planes to garden in and on! Glad to have found your blog through Twitter and this little blog party. Glad you are participating in the party so I could discover your blog! I can see how vertical gardening would help with my chickens getting my cucumbers. But how to stop them scratching in the herb bed? I just found your blog via “Digging”. Can’t wait to read more of your posts! Yay for Garden Up! Sounds like you’ve already been inspired, which makes me worried that there are more bare root fruit trees in my future, that is if Peaceful Valley has any left! The book is beautiful and inspirational. I’d LOVE to win the gift certificate! Thanks for offering it!! oh, i need a hop vine too! Not only have I been introduced to a cool new book, but I’ve found 6 new awesome gardening blogs and 7 chances to win a prize! What a glorious day! Adding my name to the door prize hat! What a great book party! Getting to visit some blogs that are new to me and a chance at great door prizes too! 1234 which giveaway do I adore? I need to order the book.. since it was sold out at the NWFGS! Excited to see your garden in it! What a great little garden book party! So looking forward to checking out your garden photos! I’d love to win the gift certificate- but I’m really happy that I found your blog! I can’t wait to go through some of your old posts. this book has me quite excited! I can’t wait to get mine! I would love to be entered into the giveaway for the gift card at Peaceful Valley. Thank you;-) You can visit the Gardeners’ Sustainable Living Project on my blog for a chance to win 1 of 16 different garden gifts, as well! Happy Spring! What a great book! And I love how everyone is linking to each other–a wonderful idea. Thank you! YEP, this vertical gardening is addictive and so is any writing by Susan and Rebecca. Must get the book. Meanwhile, back at my mini-farm, I’ve tweeted and facebooked your blog posting. I would love a copy of this book since I teach classes on gardening with vines, annuals, perennials and Clematis and I’m always looking to learn more. The photo’s look beautiful. Well this party is certainly more fun then most parties I have attended lately! Great idea. What a great party. I am finding so many new ideas. I don’t know where to begin. thanks for inviting me to you Cyber Book Party… so excited with the chance at a $25 gift certificate for Peaceful Valley…!! Love the whole cyber-party book launch idea. I journeyed to your post…the tease was one of my favorite companies, Peaceful Valley, the bonus was discovering your blog! Your garden is in a book! You rock. I am very proud of you and I hope that someday you get paid big money to do this passion. LOVE! I’m really looking forward to the book! I’m a vine fanatic too. Nice blog! I still have two months before I can put anything outside– so I need these gorgeous photos and ideas to keep me from freezing in the meantime. In other words, count me in, please! I bought a hops plant last fall- I’ll be happy to have another person to chat with on how to take care of it! Now if I can only convince my husband on getting chickens…. Congrats on having your garden in their book! I would love to win! Thanks! Looking forward to my spring garden. Garden Party fun indeed! All these wonderful gardening blogs and cool writers = inspiration! The book and the blogs shall keep me going for a long time! Really looking forward to reading the book and seeing the pics of your garden as well as the others! Loved the presentation by the Garden Up ladies at the NWFGS too! Hope I win so I can get something cool from Peaceful Valley! That is so exciting that you are featured in the book! Super cool. WOW! This is exciting. I love this book and GREAT JOB Angela!!! I just put this book on my TBR/Wish List. Thanks for the giveaway. Awesome, looking forward to readying this one! Loved visiting the NWFGS with the girls and was so glad I bought the Garden Up! book- I can’t wait to get started on my yard! Wow, I just decided to buy two espaliered cherry trees. Where did you get a three way (tree, i mean)? I would love to win this one…. Well, hello neighbor! Glad I found you through Urban Gardens. I’ll definitely be following your blog, and am super excited about this book and great prizes. Fantastic! I am in awe of these new blogs (say those words with an Irish accent and you’ll sound lovely). I especially like the white/black type contrast. I would love to win a copy of the Garden Up book, using some of its ideas and give the old sun a much better chance of reaching my plants. (did you hear that rhymed phrase?) G’day. I am totally getting the book, even if I don’t win a prize. Congrats! It’s so cool that people I’ve been following for years are getting their own books and how exciting that they featured your garden. Oh yes! Please enter me! Thanks. This is a book I need to get. Great subject! Here’s to more living green in our neighborhoods! Thank you! The book looks really inspiring! Please enter me in the contest. I am so glad I found your website! Love the pictures AND I would love to win the book! great book and giveaway idea. i’ve read 4 new blogs this morning, and totally worth the time. vertical gardening may ultimately be more practical than the next extension of container gardening i was consider. Loving the cyber garden party! Thanks to all the passionate gardeners, bloggers, writers, photographers, sponsers, etc. etc. that’ve helped make this all possible… Happy reading, dreaming, growing & winning everyone! I am enjoying following all the links to all these wonderful gardening blogs! This cyber book party is a great idea and I am happy for the forecast rain in the next few days as it will give me a chance to catch up on everyone’s past inspiring blogs, so many wonderful ideas! My book is on order, no need to convince me that going vertical is a great idea! That hop vine is a beauty! I love it when a plant is beautiful and also edible. I would definitely use the Peaceful Valley gift card. Hooray for hops! What a great use for a telephone pole. I’d love to win the gift card! My first, but certainly not my last, visit to your blog. Please enter my name to win. I’m planning on an espalier myself. I was thinking apple, but espalier 3-way cherry? That is sounding hard to resist. I love this book, and I’m already hoping to make a gutter garden in my narrow side yard. Great book idea and great prizes, too! I look forward to reading the book! What a beautiful garden and blog you have too. I am looking forward to reading Garden Up — and excited about the chance to win on of your party favors too. Thanks. Even though I never win anything, the new book is a definite winner. So happy Pam at Digging told me about it. Thank you for the opportunity to win! Happy Gardening! Pamie G.
I had never heard of a hop vine before — now that’s what I call gardening up! Love your blog! Thanks so much for the info and links to so many other great gardening sites. This book is an inspiration! Congratulations on being included! I can’t wait to pick it up! So glad to have stumbled onto your blog through this book party! Subscribing after I comment… Grapes and/or kiwi are at the top of my list for growing edibles. What a great contest. Whoever wins is very fortunate. How fun! 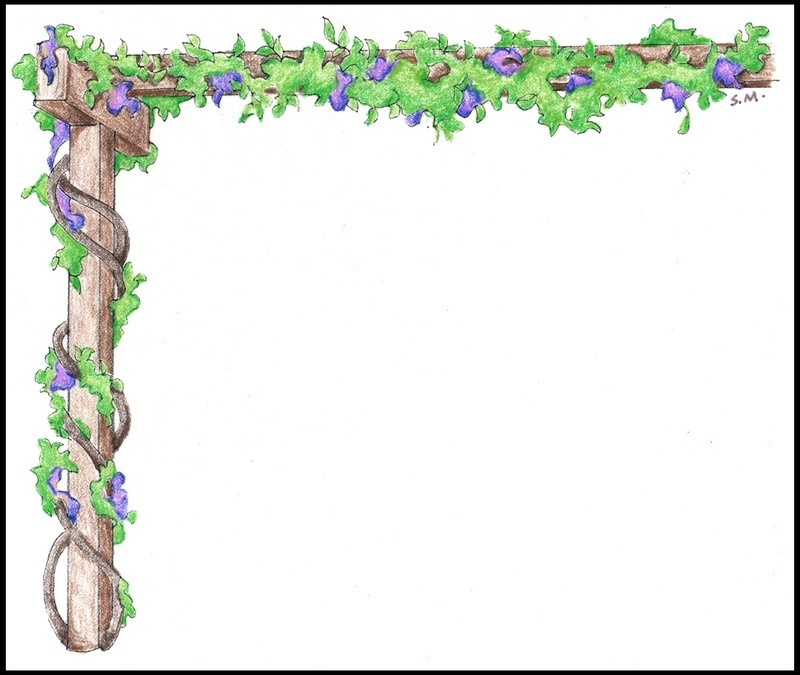 I’m working on a fence wall with woolly pockets right now and could use a little extra plant cash :-) Thanks for the contest – I can’t wait to read the book.